Friday I started a new HALS adventure. My mother turned 90 last Christmas and my gift to her was a weekend trip together. She enjoys reading this blog – in fact she is probably my most faithful reader – and asked that I take her to see some of the HALS sites I write and talk about. 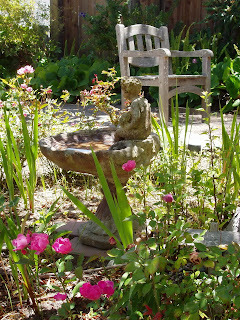 I decided to make a trip to Monterey County because it’s just a one and a half hour drive, and because there are so many historic gardens there I knew we’d find plenty to do. Our first stop was Casa Soberanes – a small site at the busy corner of Pacific and Del Monte. The garden and adobe house are set above the surrounding sidewalks and across the front and one side of the property there is a stonewall varying in height from 30” to 5’ high. The stone is “chalk rock” which is light in color – white and buffy. There are square, stone pillars at the corners and entry gates. 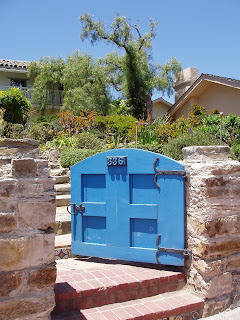 The gate is wood, made of heavy timbers with ornamental iron hinges and it is painted a vibrant blue, in contrast to the pale stone. The garden has a simple, axial layout with a single central path about 4’ wide. The path leads straight to the center of the house, which is set perpendicular to the path. The path starts as brick with some tile inlays and then changes to stone. I wonder if the brick is original or was added when the brick sidewalk was installed. 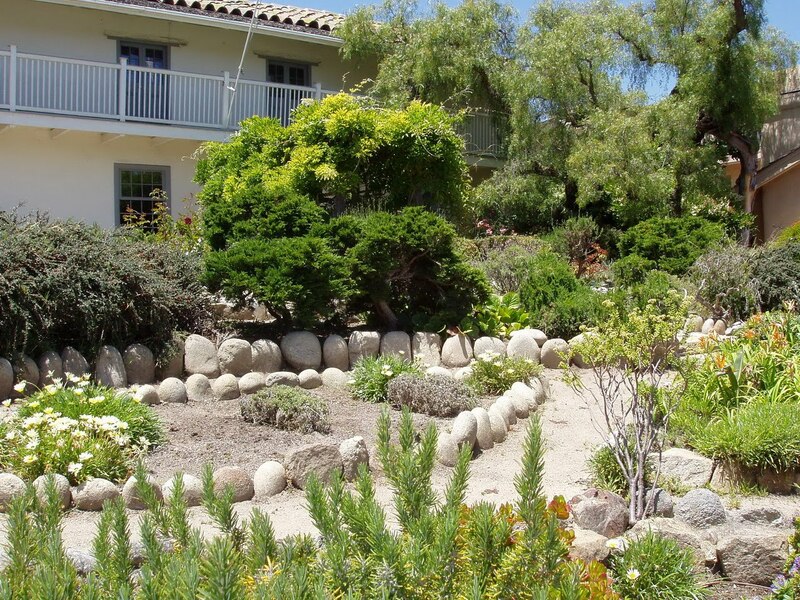 As you walk up towards the house the garden is terraced at either side stepping up the grade. All this sounds rather ordinary, but this garden is hardly that. It is filled with a delightful assortment of things to discover. Garden beds are lined with an eclectic combination of collected objects – bricks set on edge, large rounded cobbles also set on edge, irregularly-shaped stones, abalone shells – set on edge, and bottles and jars that have been partially buried leaving the bottoms sitting about 4 inches above grade. They look like beer bottles and are mostly brown and green. 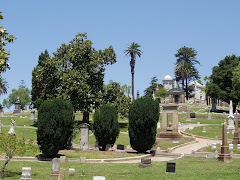 There is an equally eclectic combination of plants – old boxwood hedges line some of the paths while lavender, rosemary, daylilies, hebe, geranium, gazania, roses and many other species fill the beds. 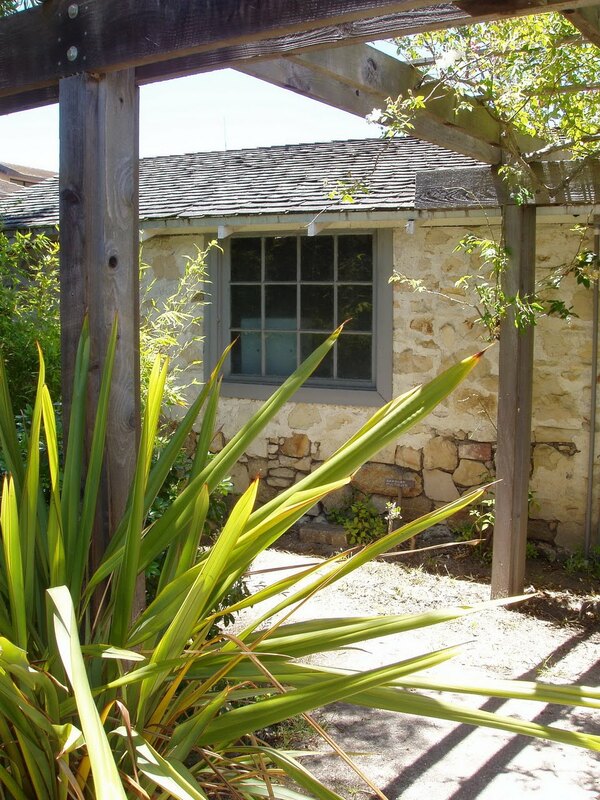 Ezequiel Soberanes owned the home and his son was a gardener at the Carmel Mission. It seems likely that Ezequiel brought home cuttings from work and grew them at home. What appears to be the oldest plant in this fanciful garden is an old craggy pepper tree (Schinus molle). Pepper trees are not known for being long-lived but this one has a three-foot diameter, hollowed out trunk that looks quite ancient. All of this would have been plenty to satisfy us so we were delighted to discover another garden space at the back of the house. The back garden is about 40’ x 40’ with trees and shrubs planted around the perimeter and compacted earth in the center of the space. Within that there are five circular planting beds each lined with either stones, cobbles, or bottles similar to those in the front garden. Even though we were close to the street the walled garden was quiet and felt protected. 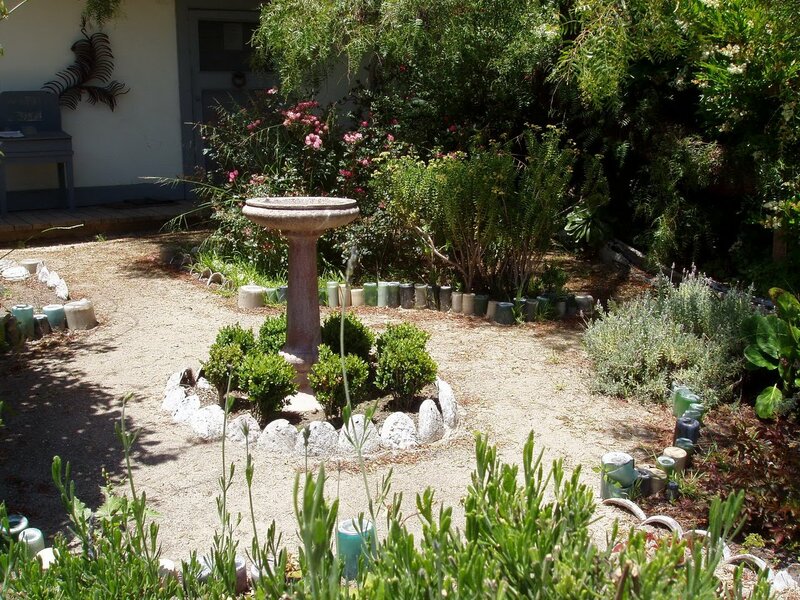 Both gardens had wooden benches, a few garden ornaments and did I mention the twelve-foot long whalebone used to edge the bed beneath the pepper tree? This is such a great post about one of Monterey's familiar landmarks! Thanks for your interesting addition to my post. Glad to hear you enjoyed the article. Keep reading - I plan to do a series on our weekend in Monterey which was wonderful.